Major health system change involves reorganisation of services, at the regional level, and may include significant alterations to a care pathway. One such change is service centralisation, whereby aspects of service provision across a region are concentrated in a reduced number of hospitals. The evaluation of major system change in acute stroke services was funded by the NIHR Health Services and Delivery Research programme, and ran from 2011 to 2017. It focused primarily on the process and impact of centralising hospital stroke services in London and Greater Manchester into specialist hyperacute stroke units. ​The changes are summarised below. 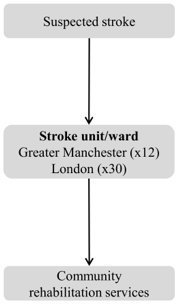 Before centralisation, in both London and Greater Manchester, suspected stroke patients were taken to the nearest A&E department to receive stroke care. Both areas centralised their hospital stroke services into ‘hub and spoke’ models, consisting of a reduced number of ‘hyper acute’ stroke services providing acute stroke care up to 72 hours following stroke (hubs), with a larger number of services providing care beyond this acute phase (spokes). Implemented 2010; sustained throughout study. Eight services were designated as Hyper Acute Stroke Units (HASUs), admitting suspected stroke patients 24h per day, 7 days per week (24/7), and 24 as SUs and TIA services, while five services were decommissioned. 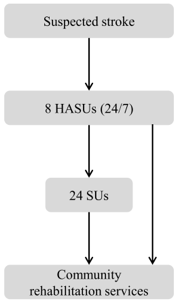 All stroke patients were eligible for treatment in a HASU; All HASUs admitted suspected stroke patients 24/7. Three hyperacute services were designated: one Comprehensive Stroke Centre (CSC) and two Primary Stroke Centres (PSCs); 11 District Stroke Centres (DSCs) provided post-4h care and ongoing acute rehabilitation services. No stroke services were decommissioned. 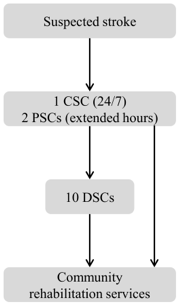 Only stroke patients presenting within 4h of developing stroke symptoms were transferred to a CSC/PSC. 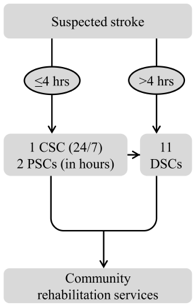 The CSC admitted patients 24/7; PSCs only admitted in-hours. This was a mixed methods evaluation, drawing on combining quantitative methods (analysing what works at what cost) and qualitative methods (analysing factors influencing development, implementation, and sustainability of changes). analysis of “what works and at what cost?” with qualitative analyses of “understanding implementation and sustainability” in order to analyse major system change in acute stroke care in a range of settings across the English NHS. What are the key processes of and factors influencing the development and implementation of the acute stroke service reconfigurations? To what extent have system changes delivered process and outcome improvements? Have changes delivered improvements that stakeholders (e.g. commissioners, staff, patients and the public, and reconfiguration leads) think are worthwhile? Have changes delivered value for money? How is service reconfiguration influenced by the wider context of major structural change in the NHS? The evaluation was a collaboration between stroke clinicians and academics based in London and Greater Manchester, and actively involved a wide range of other stakeholders, including stroke patients and carers, commissioners, and the voluntary sector. The research team included Chief investigator Professor Naomi Fulop, and co-investigators Professor Anthony Rudd, Professor Pippa Tyrrell, Professor Ruth Boaden, Professor Charles Wolfe, Professor Christopher McKevitt, Professor Steve Morris, Dr Angus Ramsay, and Rachael Hunter. Key findings from this evaluation are summarised below. To date, our published research has been referred to in national policy (Five Year Forward View), clinical recommendations (RCP Stroke Clinical Guideline), and has been cited in several ‘case for change’ documents’, including in Greater Manchester, where further centralisation was implemented in March 2015. Centralised stroke services can offer patients and carers a good experience of care (despite the need to travel further). It is important that clear information is provided at every stage of care. Service standards linked to financial incentives help ensure that services have the capacity to provide the right care at the right time. Change is not a one-off: important to attend to evidence and consider further change if appropriate. Italicised findings are as yet unpublished.